Our research activities encompass the development and optimization of new therapeutic nucleic acids. Overall, their formulations, delivery, targeting according to routes of administration constitute our main research activity and challenge. 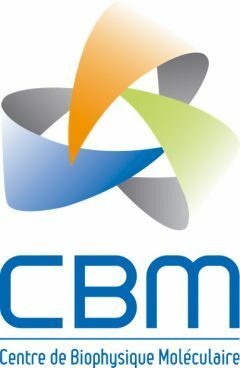 This is a multidisciplinary research field requiring chemistry, molecular and cell biology as well as animal models. Our long-lasting expertise in plasmid DNA transfer by synthetic vectors is exploited to the delivery of other types of nucleic acids including oligonucleotides, DNA decoy, siRNA, microRNA and mRNA. Our formulation called Lipopolyplexes, a ternary complex between Liposomes, a Polymer and a Nucleic acid is used in the frame of pre-clinical experiments for therapeutic applications. This is the case of mRNA-based vaccines against cancer. We wish to strengthen this axis by improving in vivo delivery for pre-clinical trials and hopefully clinical trials. The access to large quantities of therapeutic mRNA thanks to the RNA cell factories project will open new potent mRNA-based applications such as gene editing using CRISPR/Cas9 mRNA for gene therapy. For this purpose, more potent mRNA delivery vehicles are designed. Regarding gene transfer, we have now identified several devices for designing a DNA Integrative Artificial virus that could be an alternative of recombinant virus. This is tackled by optimization of each known devices, their packaging as well as the co-assembly of DNA and mRNA for gene integration by transposon/transposase or gene editing. For this, bioengineering of plasmid DNA is developed by coupling specific intracellular signals as peptide mediated cytosolic transport and DNA sequence for nuclear import. We also explore the co-delivery approach of siRNAs, anti-miRNAs and/or DNA decoys against oncogenic genes. DNA decoys are based on bioengineered small nucleic acids for cell and intracellular targeting. 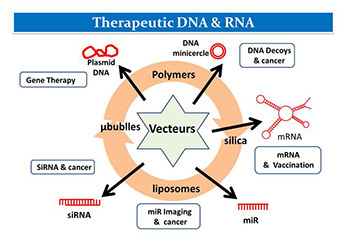 Sonoporation based on ultrasound (US) and microbubbles (MB) provides significant results to deliver nucleic acids and drugs in vitro and in vivo on tendon repair and tumor regression. Current developments of cationic MB with smaller size and high capacity of encapsulation as well as applications are going-on. US waves delivering physical forces on cells can lead to cell death, drug delivery or tissue regeneration depending on parameters and cell types. Thus potential mechanical sensors involved in mechanotransduction, Early Growth response-1, Adenosine monophosphate kinase and Yes-associated Protein /Transcriptional coactivator with PDZ motifs is currently under investigation. Since those molecules are involved in pathways related to either proliferation or apoptosis, getting a clear knowledge of activated process will allow to fine tune the use of US. Pigeon L., Gonçalves C., Pichon C., Midoux P. (2016) Evidence for plasmid DNA exchange after polyplex mixing. Soft Matter 12 (33) 7012-7019. Delalande A., Gosselin M.-P., Suwalski A., Guilmain W., Leduc C., Berchel M., Jaffrès P. A., Baril P., Midoux P., Pichon C. (2015) Enhanced Achilles tendon healing by fibromodulin gene transfer. Nanomedicine 11 (7) 1735-1744. Pigeon L., Gonçalves C., Gosset D., Pichon C. and Midoux P.(2013) An E3-14.7K peptide that promotes microtubules-mediated transport of plasmid DNA increases polyplexes transfection efficiency. Small 9, 3845-3851. Billiet L., Gomez J.-P., Berchel M., Jaffrès P. A., Le Gall T., Montier T., Bertrand E., Cheradame H., Guégan P., Mével M., Pitard B., Benvegnu T., Lehn P., Pichon C. and Midoux P.(2012) Gene transfer by chemical vectors, and endocytosis routes of polyplexes, lipoplexes and lipopolyplexes in a myoblast cell line. Biomaterials 33, 2980-2990.